I always struggle to figure out what in the heck to call the posts I do about our front porch because it’s really not a front porch. Not even close. It’s more like a front step. Or maybe a stoop? I honestly don’t know. 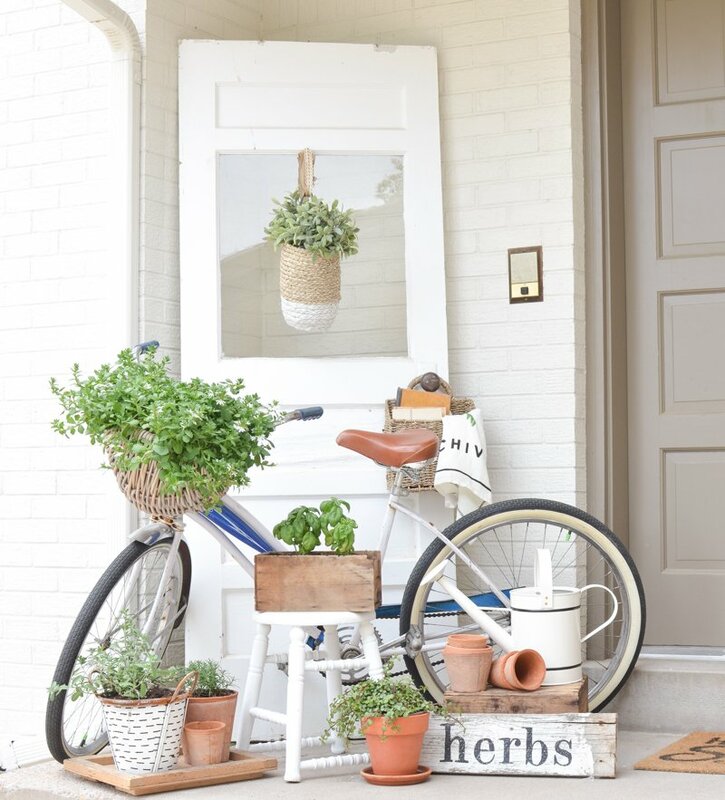 But what fun would it be to call this post our “summer stoop” or “summer step”?! I mean, that sounds ridiculous. So I’m left with no choice but to call this our farmhouse style summer porch. 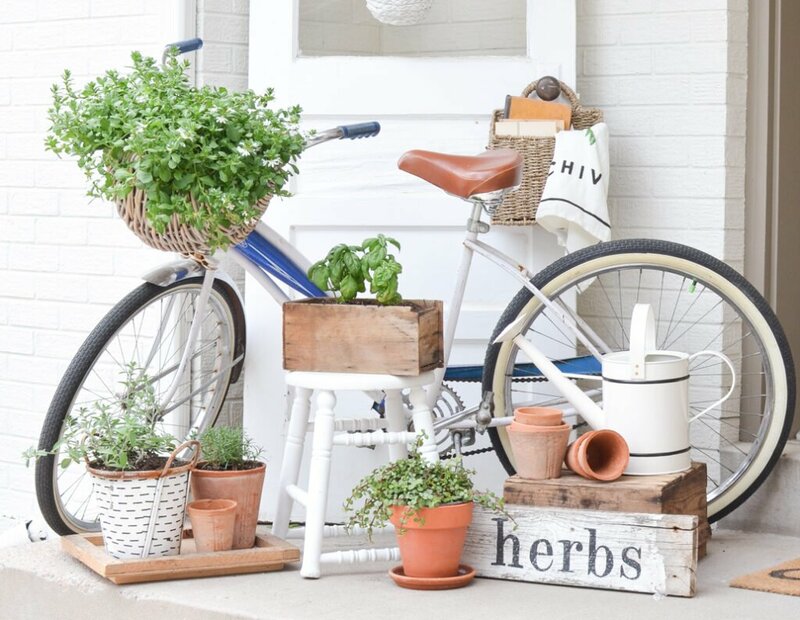 We’ll just pretend that it’s a porch and not a step, sound good? I actually decided to do this post kind of spontaneously a few days ago because I stumbled on a photo from our front porch last summer. If you’ve been around for a while (and high five if you have!) 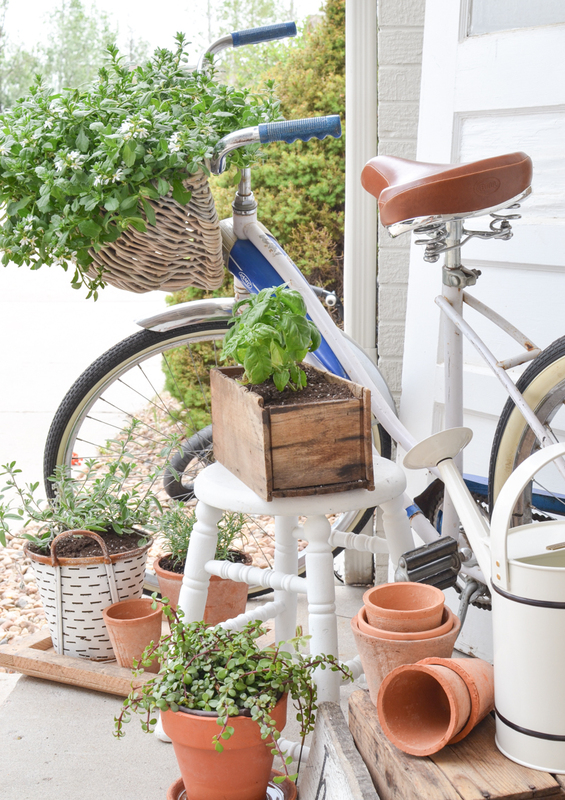 you might remember that one–I used my Grandma’s old vintage bike and tons of flowers. It was actually one of my favorite posts ever, so I decided why not just do it again?! But this time around I switched up a few things and went with more of an easy and simple garden themed look. I actually think I might love it even more than what I did last year! So the star of the show here is obviously my Grandma’s old bike. Isn’t that cool?! She actually gave it to us about nine years ago. It was in pretty rough shape when we got it, so we replaced the seat and also updated the tires. Then of course I had to put a large basket on the front for flowers and purdy things. 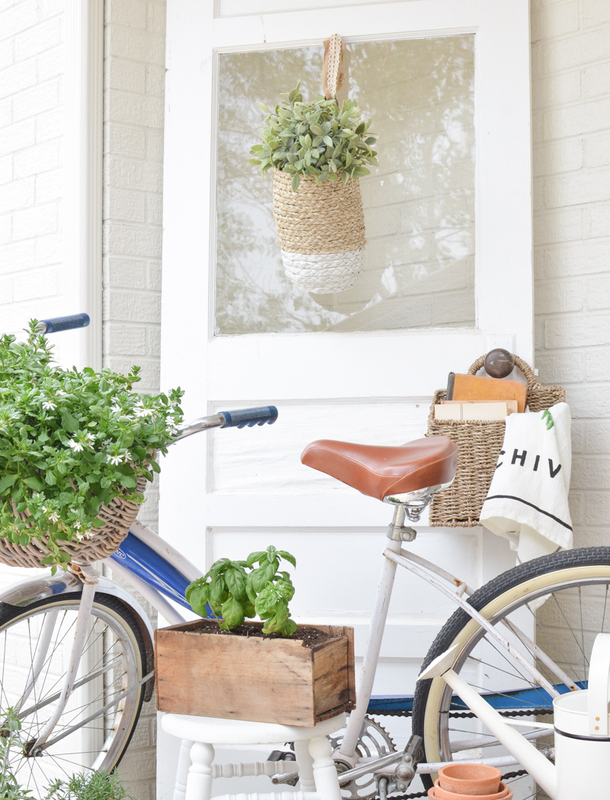 I honestly never ride it, but I think it works so perfectly in this little corner on our front “porch”. Instead of using a bunch of colorful flowers like I did last year, this time around I decided to do more of a garden theme for this look. 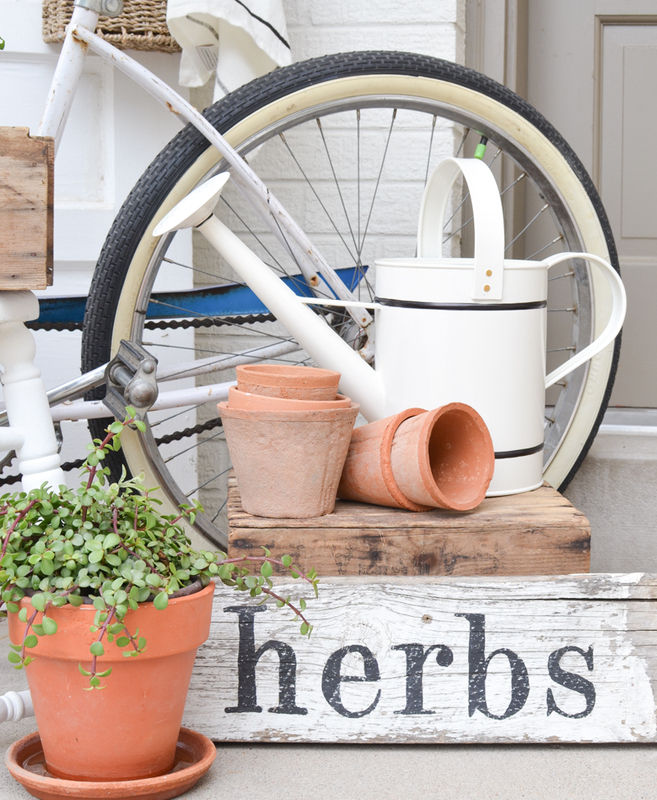 The herb sign was a super quick DIY project last summer, so I threw that in along with a bunch of potted plants. I love the more neutral, easy laid back vibe this time around. This wooden “tray” is actually part of that vintage fan crate that I turned into a side table. Remember that project? It was so fun and it’s still one of my favorite DIY’s. (You can find it here.) Well I held onto the lid from that crate because I knew I could use it for something else. 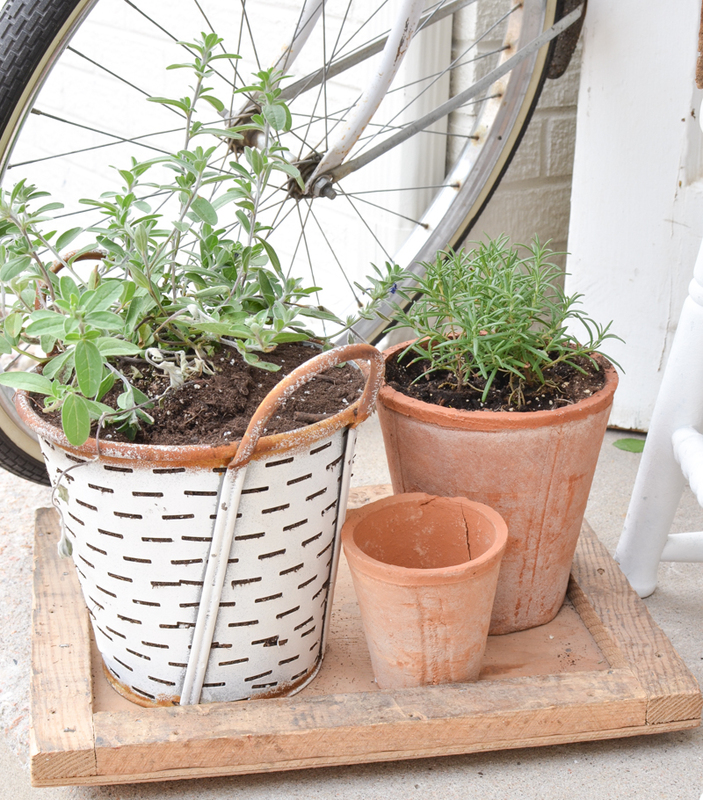 I think it makes the perfect little tray for these potted plants and it adds the perfect amount of texture. And if you’re curious, all the aged terra cotta pots are from Michael’s. 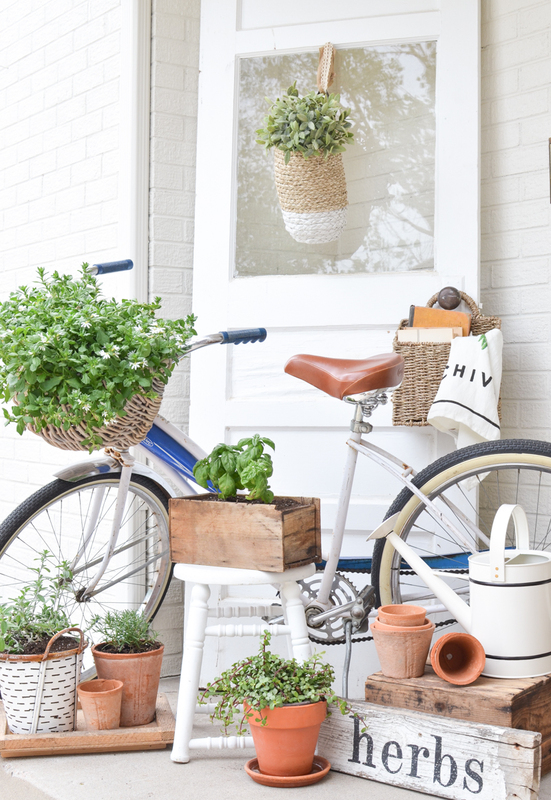 I’ve said it before and I’ll say it again–summer decor is my FAVORITE. It’s just so darn easy and quick. I seriously had so much fun recreating this look from last year. I liked putting a different spin on it this time around and it really only took me about twenty minutes to put all this together. 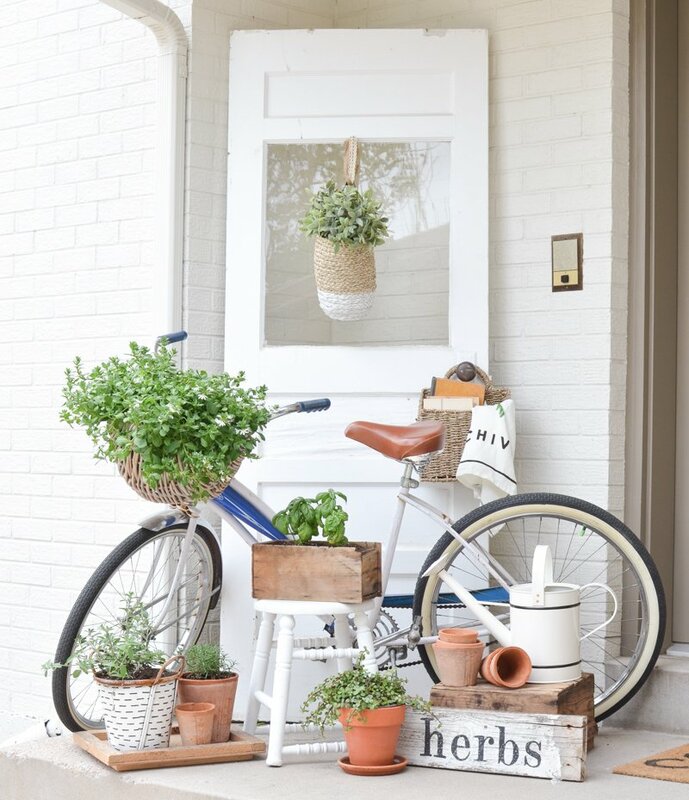 Just throw some potted plants together, an old door and a vintage bike and badda bing badda boom. Summer porch done. Easy peasy. Oh I love it, that bike is perfect too. 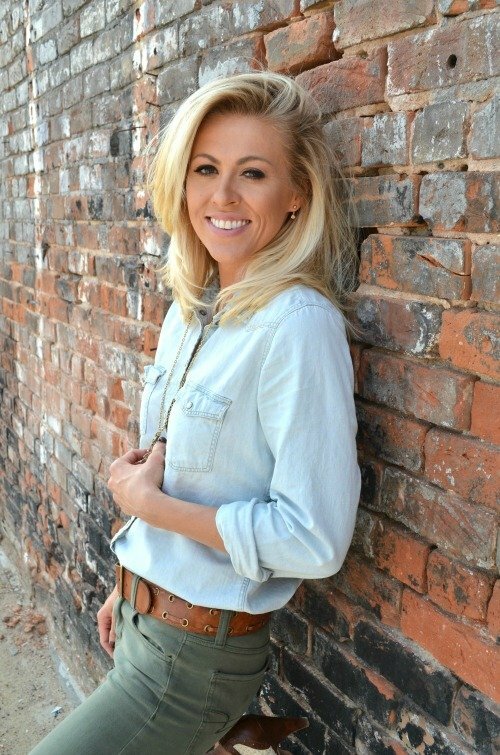 I loved it last year and love it again for this summer look. It’s so welcoming. Especially sweet with Grandma’s bike. Looks great. Thanks Sandee! A little more simple than last year’s look but I still love it. Such a great bike! 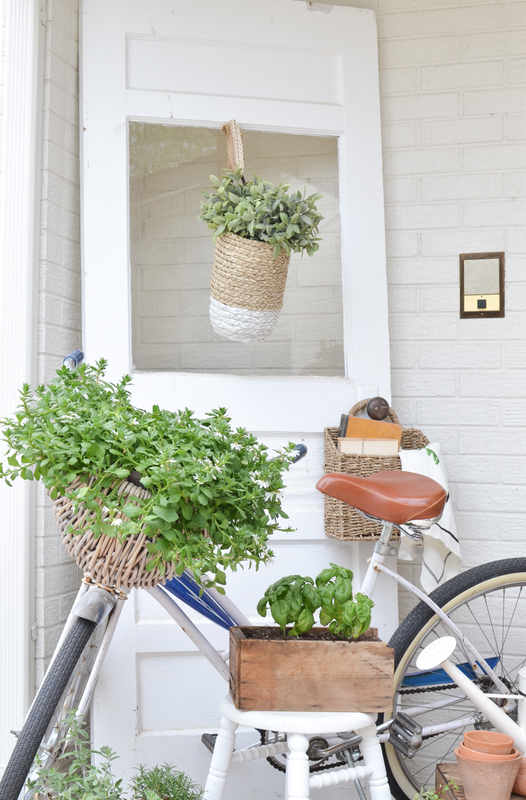 You styled your porch perfectly, loved it! Super cute! way to make a stoop step-up and act like a porch 🙂 You have a definite eye for balance! It’s saying Summer over & over! Heck yes Jan, I’m ready for some fresh lemonade! Well Sarah you’ve done it again! it makes me feel so good to read your posts with your many and so darn cute ideas. First off such a treasure to have your grandmas bike! lucky you. 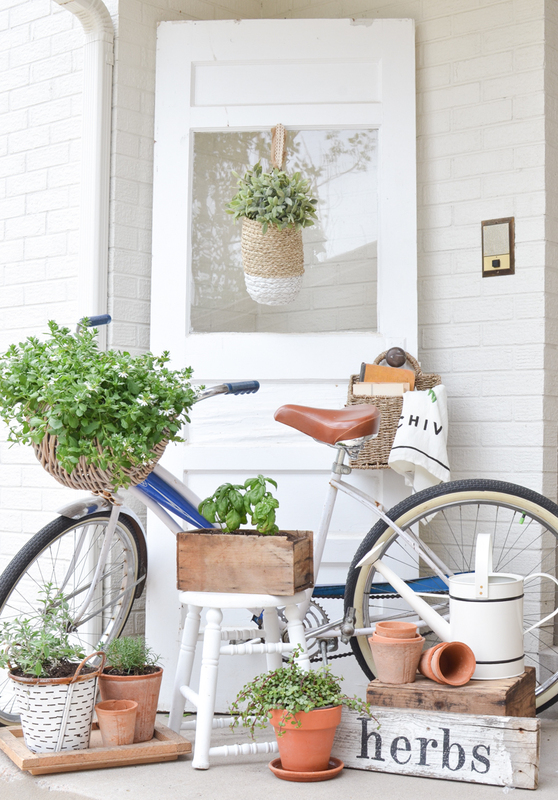 The porch is adorable. i like the way you did just greens. sooo pretty. Enjoy your sweet porch Sarah. I’ve only been with you a short time so now I’m going back to see the last time you used the bike. Thanks Sarah. This is picture perfect!!! 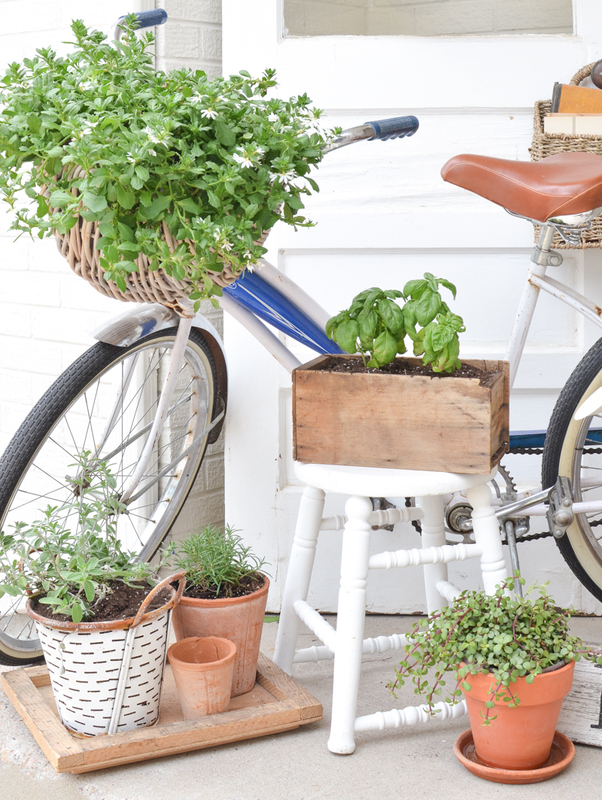 I love how you used plants and your grandmother’s bicycle! It’s just adorable! We live on top of a very large hill and I can only put very heavy decor on the porch or it will blow away!!! I wish I could have cuter things! Oh dang! You must get some strong wind up there Dena. We have that here too occasionally but usually it’s not too bad! Girl, you are amazing! I love your blog and ALL of your fantastic ideas! 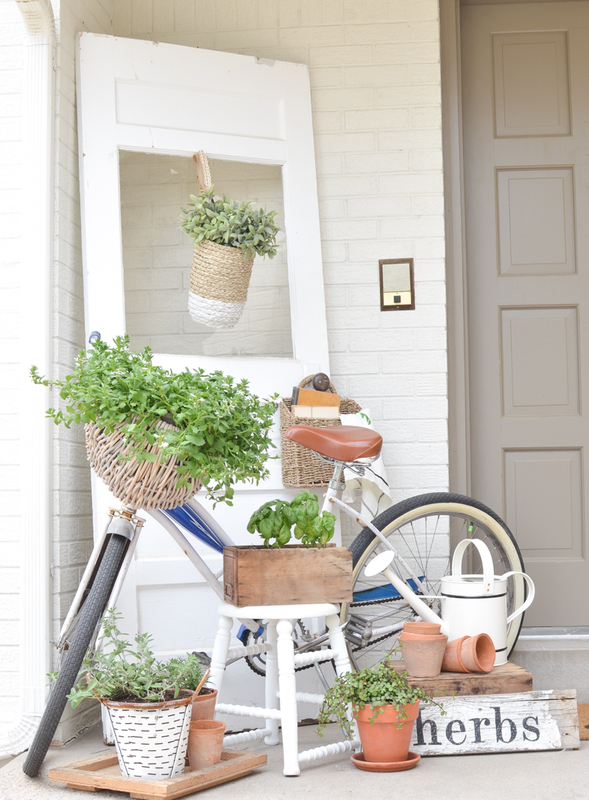 The stoop is beautiful…I love everything about it. Very nice!